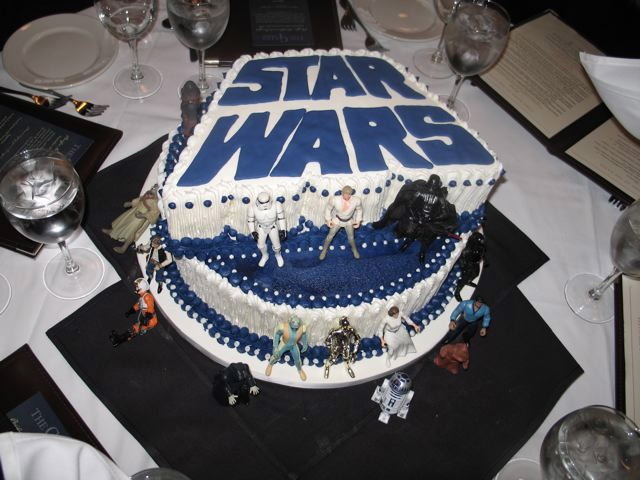 Kenton's Infotainment Scan: Happy birthday, Yoda. Thirty, you are. 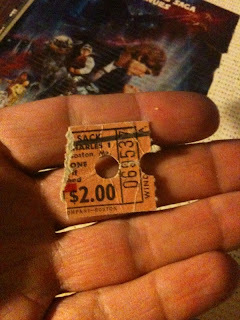 The ticket stub from the first time I saw Empire in 1980. $2! 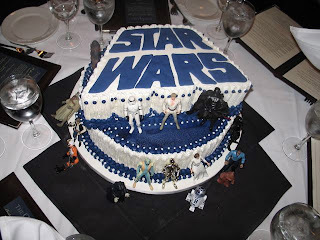 Maybe you can have your Star Wars cake and eat it too. It's a waste of time sitting in a movie theatre when you could be sightseeing. It's a valuable use of time relaxing in a movie theatre when you could be destroying your feet sightseeing. On Friday, though, I got to do both. Jennifer, Jason, and I went to see the Empire Strikes Back at the Chicago Field Museum - a frigging amazing place that I actually like better than New York's Museum of Natural History. Empire, of course, has nothing to do with natural history, but the Field Museum booked it and George Lucas himself as a fundraiser in celebration of the film's 30th anniversary. 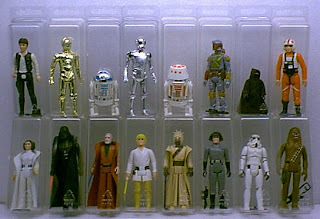 By way of background, I should say that I've written about Star Wars on this blog before. A lot. Last Thanksgiving, for instance, I watched all six movies in a row and wrote about them in a bleary-eyed stupor here. So, now that we know the illness with which we're dealing, back to the review. The good news: the movie itself is still a pretty damn great theatre experience, even sans George Lucas. Although the screen was a bit smaller than I expected, the shiny and new digital print, incredibly pristine sound, and Field Museum exhibits bundled into the price, made it well worth the $30 admission. Empire is widely heralded as the best Star Wars film, which is interesting considering that it's the one with no ending. It does have a crazy great snow battle and chase through an asteroid field, a Freudian bombshell, and the first appearances of Yoda, Boba Fett, and Lando Calrissian - better known as the guy who made me, at age 13, thirst for the taste of Colt 45: the official beverage of Bespin, the city in the clouds. I remember the first time I saw Empire very well, because I was living with my parents in Boston. They let me skip school that day so I could see it, but the downside was that I had to take the bus to Harvard Square, find the transfer to the subway, and remember my stop all by myself. Why, I could have been murdered, kidnapped, or drafted by the Boston Celtics! I wasn't, so I walked up to the ticket booth at the first showing of the day, and confidently said, "One kid, please." "One kid, please," repeated a nearby usher, whose sarcastic mockery of my request showed how miserably I failed at looking like a confident, 13-year-old man about town. "Screw you," I cried. No, I didn't. But I should have! In this day and age of insane opening weekends and fast audience drop-offs, it's weird to consider that, 30 years ago, the Sack Charles Theatre was the only one in Boston that showed the film. And admission was a mere $2 (see photo at the top of this post). When the lights went down and the movie started last Friday, I felt the same giddy thrill I felt the first time I saw it. I remembered sitting in the theatre as a kid, wondering what the ongoing adventures of Luke Skywalker would be like. I remembered being surprised at the tone and structure of the film, its shocking violence (tame by today's standards), and the aforementioned ending or lack thereof. "You mean they're not going to rescue Han Solo until the next movie?! Boooooo!" What surprised me the most on Friday was the pacing: how quickly Empire moves along on a wave of emotion, chemistry, and ambiance: the dark tones and lush locales counterbalanced by riveting action sequences and some pretty great jokes. In other words: everything that's missing from the prequels. As I've said before, for me Empire works on the strength of its character mashups: R2-D2, meet Yoda. Han, meet C-3P0. Chewie, meet C-3P0. Leia, meet Lando. Han, meet Vader. Luke, meet Vader. Luke, meet Lando. Giant worm, meet asteroid. We also get some great set pieces: Luke becoming a Jedi Knight under the tutelage of Yoda, Han and Leia getting a room (with C-3P0 playing the role of - ahem- c***-blocker), the mysterious slow-mo battle under a haunted tree on Dagobah, the battle between Luke and Vader, and the landing and nearly instant evacuation of Hoth by the Rebellion. The other big kick for me is Mark Hamill, who clearly takes his role more seriously than anyone else in the film. Yeah, the theatre always breaks out into laughter when he cries, "No, nooooo!" upon finding out his parentage, but I actually like that scene and remember that no one laughed at it when the film first came out. In fact, I remember leaving the theatre in 1980 thinking, "Vader's lying. He's not Luke's father." It was only on subsequent viewings that I realized he was being, as Paula Abdul once sang, "Straight Up." After the film, Jason and Jennifer had some interesting observations. Jason commented on the film's great lines, and there are a lot of them, including the iconic Leia to Han: "I love you!" and Han to Leia: "I know." He also mentioned the discrepancy between the goofy and wacky Yoda of Empire and the serious, humorless Yoda of the prequels. I know what he's getting at, but I chalk it up to 50 per cent Yoda pretending not to be Yoda to test Luke and 50 per cent to Yoda spending 20 years on Dagobah by himself. Jennifer had never before seen Empire in a theatre, and she said she found the scenes with Luke and Yoda to drag compared to the rest of the film. I've heard that comment before. I believe that the Free Press movie critic Alison Gillmor said the same thing when she reviewed the film's 1997 re-release. I've felt that way when I've watched the film on DVD at home. In the theatre, I still got a kick out of little Yoda using the Force to lift the X-Wing out of the swamp and telling Obi-Wan, "There is another." I did giggle a little at Luke doing a backflip with Yoda on his back, like a futuristic Rocky carrying around Burgess Meredith. But here's where Empire gets a bit screwed by the revisionism of the prequels: Why does Luke remember being on Dagobah when we know he never has been? Or is there a visit to see Yoda between episodes III and V that we don't know about? And since we know that Obi-Wan Kenobi was present at the birth of Luke and Leia, wouldn't his ghost know what Yoda is talking about when he says, "There is another?" Takes a bit of the charge out of the moment, no? In Empire, Darth Vader is, like all great villains, menacing and hilarious as he represents a very real threat to not only Luke but his own employees, as he kills one Imperial officer after another for f***ing up, like a lethal Donald Trump. And a special honorable mention goes to John Williams for a great soundtrack, from the Imperial march and Yoda's theme to the soothing Bespin theme and swirling fanfare when the Millennium Falcon navigates the asteroid field. 1. The door opens on Cloud City, Darth Vader rises at the end of the table. Han Solo shoots at him, Vader takes his gun. Boba Fett steps out of the shadows. When Empire is over, its non-ending turns out to be the best-possible ending. Absolutely no one wins. Vader still doesn't have his prize. Luke has a robotic hand. Leia is alone. 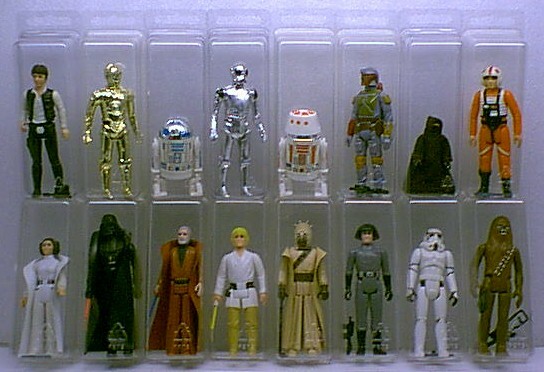 Han is frozen in Carbonite. Which brings me to 1983, and the time I waited in line for an entire day to see Return of the Jedi at Grant Park with my friends and a Winnipeg Free Press reporter. But I'll save that for the 30th anniversary of Jedi. 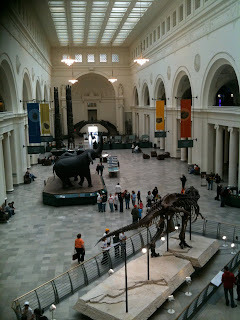 Meet you in three years at the Field Museum! Flashback to 1980: the Chicago Field Museum, circa Friday. Awesome post! I'm of the belief that one needs some time to relax in between sightseeing, and that a movie is the perfect way to do that. I wish movies were still $2.00, they've gone up to something like $10.75. If Lucas does any more Star Wars movies, we'll have to mortgage our houses to pay for admission! And the years of seeing the "Nooo" scene mocked and parodied on the internet means that I can no longer take it seriously. I find it hilarious! birthday? i was not aware of such an event! belated happy bday kenton!